Temple Texas saw no change in its median house price of $159k this February compared to last year. Active listings were down 5.9% while closed sales were up 10.7%. These two stats, along with 14 fewer days on market seems to show a trend towards a rising median price if inventory continues to sell. 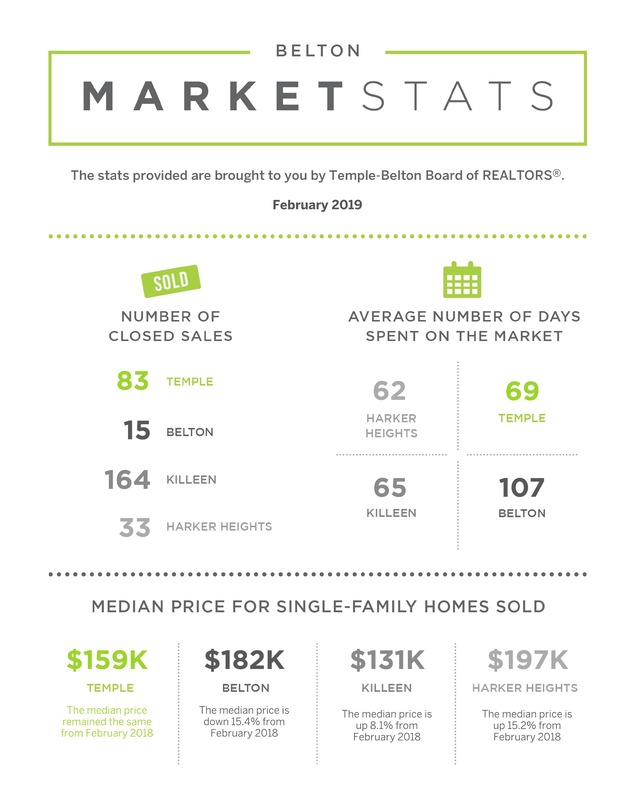 In Belton, the median price was down 15.4% however this is most likely due to the fact that the number of closed sales were down 16.7% to a total of 15 in February 2019 compared to last year. As active listings were down in Killen by 35.4% down to a total of 332 active listings in February 2019 median price rose 8.1%. At $131k, the rising prices along with an increasing percentage of closed sales by 24.2% these upward trends seem to be a change from the trends at the beginning of the year. Harker Heights saw both it’s median price and closed sales percentages increase by 15.2% and 37.5% respectively. This might be due in part to the somewhat small number of closed sales with an increasingly smaller inventory.